What it is, is a record of this weekend’s progress. 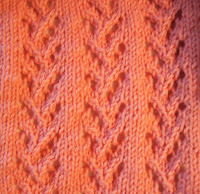 Saturday morning, 3 full lace pattern repeats had been completed, (and a new ball of the waterchestnut (pale peach) yarn started. Sunday morning found 5 full repeats. I’m loving this lace. I like the braided cable effect it creates. It’s interesting—the simple traveling cable of the bronze gauntlets has a very different look (but a very similar stitch pattern) to the pattern used in the Cascade socks (more on them later this week) —this lace pattern has a very similar look, (branching/braided) to the bronze gauntlets, but absolutely no similarity in the knitting! 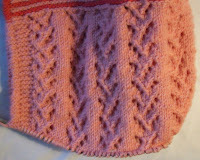 The stitch is from the Big Book of Knitting Stitches, with a single variation (1 stitch!) and its exactly what I wanted! Friday, on the subway ride home, the gauntlets got gussets started (nattering nabobs of nepotism! That is a mouthful of G’s!) And remained untouched since then—they didn’t even get pulled out of the bag for a photo op. I’ll do more of the gusset today, and maybe will have them finished by Wednesday. Just in time--for not wearing them! And the original plan (to make them for wearing at work)? Well if this past week is any indication, I’ll need them for the commute. I’ll be wearing summery short sleeves at work (which is sauna like!) and the gauntlets will be needed out side, not in! Outside, the locust tree has golden tipped branches, but most of the foliage on it (and other trees) is still green—but there have been cool nights, and the coleus plants have suffered. I snipped a healthy branch of one this morning and put it in water and those jells for rooting plants—the low angle of the sun makes the office sunnier than ever--the awning works great against the hot summer sun, but now, the sunshine streams in. You're knitting like the wind! I like your lace pattern - more architectural than frothy. What does it look like blocked?